Definition at line 498 of file DerivedTypes.h. Implement support type inquiry through isa, cast, and dyn_cast. Definition at line 529 of file DerivedTypes.h. This constructs a pointer to an object of the specified type in a numbered address space. Definition at line 629 of file Type.cpp. 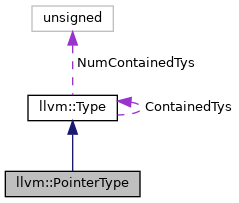 References llvm::LLVMContextImpl::ASPointerTypes, assert(), llvm::Type::ContainedTys, E, llvm::Type::getContext(), isValidElementType(), llvm::Type::NumContainedTys, llvm::LLVMContext::pImpl, llvm::Type::PointerTyID, llvm::LLVMContextImpl::PointerTypes, llvm::Type::setSubclassData(), llvm::Type::Type(), and llvm::LLVMContextImpl::TypeAllocator. Referenced by llvm::VNCoercion::analyzeLoadFromClobberingMemInst(), atomicSizeSupported(), buildPCRelGlobalAddress(), llvm::ConstantFoldGetElementPtr(), llvm::orc::createIRTypedAddress(), llvm::createMemCpyLoopKnownSize(), llvm::createMemCpyLoopUnknownSize(), createMemSetLoop(), createPrivateNonConstGlobalForString(), DecodeFixedType(), llvm::SIFrameLowering::emitEntryFunctionPrologue(), findUser(), FunctionNumber(), getAccessType(), llvm::ConstantExpr::getAddrSpaceCast(), llvm::SelectionDAG::getEVTAlignment(), getFoldedAlignOf(), getFoldedSizeOf(), llvm::GetElementPtrInst::getGEPReturnType(), GetHeapSROAValue(), llvm::VNCoercion::getLoadValueForLoad(), llvm::VNCoercion::getMemInstValueForLoadHelper(), getMulHu(), getNegativeIsTrueBoolVec(), llvm::Module::getOrInsertFunction(), llvm::Module::getOrInsertGlobal(), getOrInsertGlobal(), llvm::Type::getPointerTo(), llvm::AMDGPULegalizerInfo::getSegmentAperture(), getUnqual(), llvm::SCEVExpander::hoistIVInc(), INITIALIZE_PASS(), instrumentMaskedLoadOrStore(), inversePermutation(), isCallPromotable(), isLoadInvariantInLoop(), llvm::SITargetLowering::isTypeDesirableForOp(), LLVMPointerType(), llvm::TargetLowering::LowerCallTo(), llvm::R600TargetLowering::LowerFormalArguments(), llvm::NVPTXTargetLowering::LowerFormalArguments(), LowerMULH(), llvm::AMDGPUCallLowering::lowerReturn(), llvm::RandomIRBuilder::newSink(), parseOptionalLinkageAux(), PerformHeapAllocSRoA(), performMaskedAtomicOp(), RedzoneSizeForScale(), llvm::R600TargetLowering::ReplaceNodeResults(), shouldFixMainFunction(), shouldKeepInEntry(), simplifyAllocaArraySize(), SimplifyGEPInst(), simplifyNeonVld1(), simplifyX86MaskedLoad(), simplifyX86MaskedStore(), TypeSizeToSizeIndex(), llvm::AMDGPULibCalls::useNative(), llvm::InstCombiner::visitAddrSpaceCast(), and llvm::InstCombiner::visitAllocaInst(). Definition at line 526 of file DerivedTypes.h. Referenced by llvm::MachineIRBuilder::buildGlobalValue(), canDemoteGlobalVar(), llvm::CastInst::castIsValid(), llvm::orc::cloneGlobalVariableDecl(), llvm::FunctionComparator::cmpConstants(), llvm::FunctionComparator::cmpTypes(), llvm::ConstantFoldGetElementPtr(), ConvertDoubleToBytes(), llvm::convertToDeclaration(), llvm::GlobalAlias::create(), createGlobalFwdRef(), llvm::NVPTXAsmPrinter::doFinalization(), FindAllMemoryUses(), findUser(), forceRenaming(), llvm::GlobalValue::getAddressSpace(), llvm::ConstantExpr::getAddrSpaceCast(), getArrayElements(), getAttrKindEncoding(), llvm::getCallsiteCost(), llvm::X86TTIImpl::getGatherScatterOpCost(), llvm::getInlineCost(), getNaturalGEPWithOffset(), getOpenCLAlignment(), getTypePartition(), llvm::SCEVExpander::hoistIVInc(), INITIALIZE_PASS(), llvm::isAllocaPromotable(), isCallPromotable(), isContiguous(), llvm::AMDGPU::isGlobalSegment(), llvm::AMDGPU::isGroupSegment(), isKnownTypeIdMember(), llvm::DataLayout::isNonIntegralPointerType(), isObjectDereferencedInBlock(), llvm::AMDGPU::isReadOnlySegment(), isTypeCongruent(), isUnmergeableGlobal(), isZeroLengthArray(), llvm::Intrinsic::matchIntrinsicType(), maybePrintComdat(), MergeAliasResults(), PrintLLVMName(), processInternalGlobal(), selectJumpTableArmEncoding(), SRAGlobal(), TryToShrinkGlobalToBoolean(), llvm::InstCombiner::visitAddrSpaceCast(), llvm::InstCombiner::visitBitCast(), llvm::ObjectSizeOffsetVisitor::visitConstantPointerNull(), and llvm::InstCombiner::visitGetElementPtrInst(). Definition at line 517 of file DerivedTypes.h. Referenced by buildFrameType(), llvm::concatenateVectors(), llvm::ConstantFoldGetElementPtr(), llvm::GlobalAlias::create(), createGlobalFwdRef(), decomposeSimpleLinearExpr(), llvm::AsmPrinter::EmitGlobalVariable(), FindAllMemoryUses(), findInitTrampoline(), foldOperationIntoPhiValue(), FunctionNumber(), llvm::ConstantExpr::getAddrSpaceCast(), getAttrKindEncoding(), llvm::getCallsiteCost(), llvm::getMallocAllocatedType(), getMemCmpLoad(), getMinVisibility(), getNaturalGEPWithOffset(), llvm::RISCVTargetLowering::getTgtMemIntrinsic(), llvm::AArch64TargetLowering::getTgtMemIntrinsic(), llvm::ARMTargetLowering::getTgtMemIntrinsic(), HandleByValArgument(), INITIALIZE_PASS(), isArray(), isContiguous(), llvm::isSafeToLoadUnconditionally(), LLVMBuildLoad(), llvm::SparcTargetLowering::LowerCall_32(), llvm::SelectionDAGBuilder::LowerCallSiteWithDeoptBundle(), llvm::FastISel::lowerCallTo(), llvm::Intrinsic::matchIntrinsicType(), llvm::TargetLowering::ParseConstraints(), PrintLLVMName(), readWideAPInt(), llvm::HexagonTargetObjectFile::shouldPutJumpTableInFunctionSection(), tryToElideArgumentCopy(), updateOperand(), llvm::InstCombiner::visitAddrSpaceCast(), llvm::Interpreter::visitAllocaInst(), llvm::ObjectSizeOffsetVisitor::visitArgument(), llvm::InstCombiner::visitBitCast(), llvm::InstCombiner::visitGetElementPtrInst(), llvm::ObjectSizeOffsetVisitor::visitGlobalVariable(), and wrapConstantAsMetadata(). This constructs a pointer to an object of the specified type in the generic address space (address space zero). Definition at line 513 of file DerivedTypes.h. Referenced by llvm::fuzzerop::anyPtrType(), appendToGlobalArray(), ComputePostOrders(), llvm::InlineAsmKeyType::create(), createCallInst(), createMalloc(), llvm::createShadowStackGCLoweringPass(), DecodeFixedType(), findInitTrampoline(), llvm::CodeExtractor::findInputsOutputs(), FunctionNumber(), llvm::InlineAsm::get(), llvm::ScalarEvolution::getElementSize(), getMemCmpLoad(), llvm::ConstantExpr::getOffsetOf(), getSignature(), llvm::ConstantExpr::getSizeOf(), INITIALIZE_PASS(), llvm::SparcTargetLowering::LowerF128_LibCallArg(), llvm::SparcTargetLowering::LowerF128Op(), MarkBlocksLiveIn(), parseOptionalLinkageAux(), llvm::WholeProgramDevirtPass::run(), llvm::fuzzerop::sizedPtrType(), UpgradeMaskedLoad(), UpgradeMaskedStore(), and llvm::InstCombiner::visitCallInst(). Return true if we can load or store from a pointer to this type. Definition at line 660 of file Type.cpp. Definition at line 655 of file Type.cpp. References llvm::Type::isLabelTy(), llvm::Type::isMetadataTy(), llvm::Type::isTokenTy(), and llvm::Type::isVoidTy(). Referenced by FunctionNumber(), llvm::GlobalVariable::GlobalVariable(), maybeSetDSOLocal(), and parseOptionalLinkageAux().